A barbershop next door to a dog boutique. I liked the juxtaposition of the two grooming establishments side by side. Wonder which costs more ... a session with the groomer or the barber? I'm thinking groomer. 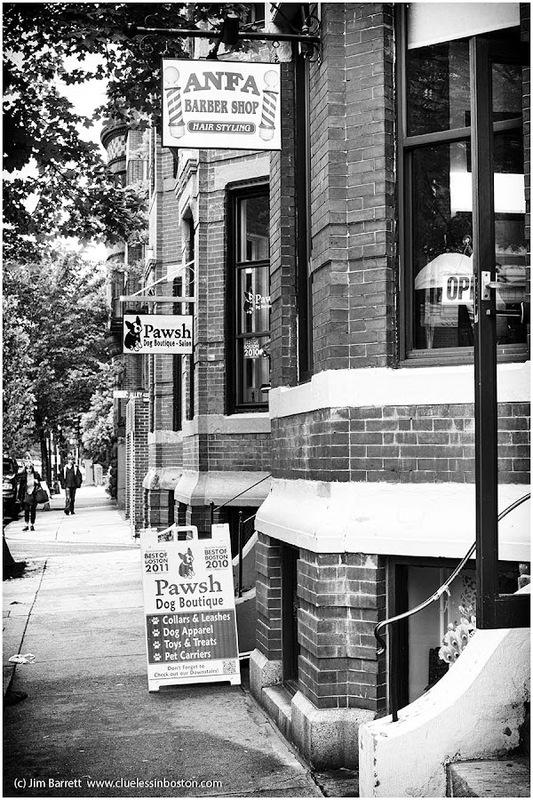 It's a beautiful b&w image!I like the dog sign in this barbershop. My guess is the dog grooming is a higher priced service than the barber shop. When rather was visiting from out of town, as a favor he took my sons into the salon where we got our hair cut. He had always gone to a barber. He thought about getting a haircut for himself and asked the price. When she told him the price, he did not ask her to cut his hair. My son, who was about 10 or 11, told the stylist "Granddad probably won't want to get his hair cut here. You have to understand, he grew up during the depression." I like this, each shop has its own stairs, each door leads to a service. Beautiful picture! Over here there's an advert for an optician, where people get very mixed up because they can't see properly. They could make a version with these two establishments, I'm sure. Oops, should have gone to Specsavers.